Learning never stops and this WordPress Learning Management System theme ensures educational centers are at par with this mantra. This responsive WP theme is designed for learning institutions and packs all the necessary features to facilitate educational processes. 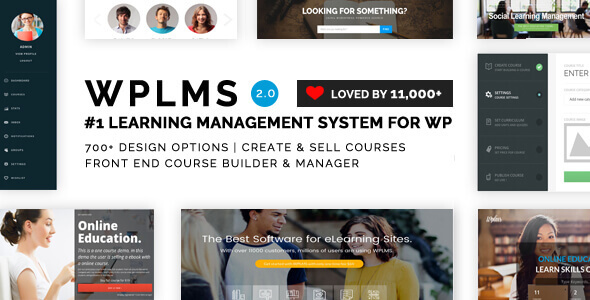 WPLMS WordPress theme favors any training center, college, corporate training centers, University faculties, MOOC platform, high schools and any other learning center whose main goal is educating the masses. There are a number of features available in this new theme to help optimize it for the internet. One of these tools is BuddyPress, a free software that helps you optimize your website for social media sites. This takes your promotional content further to a bigger audience and generates positive leads that eventually become sales clients. WPLMS gives every educational center a platform to facilitate learning to students within the same region or around the globe. There are available resources to set exams, mark them, award grades and even design certificates for those who graduate at the end. Through analytic tools, students can vet the performance of their online tutor, and likewise, educators can analyze the progress of each student throughout the course. As a private tutor, you gain more exposure and income when there is a ready website to interact with students and sell your coursework. You even get course badges you can award to each student who completes a course or performs a given assignment really well. There is free 6-month support to monitor your website for any bugs or areas of improvement. Learning goes on unhindered and in a more productive way.